Nearly a week after the first anniversary of the Japanese earthquake and tsunami that started the crisis at the Fukushima Daiichi nuclear power facility, I am still sorting through the dozens of reports, retrospectives and essays commemorating the event. The sheer volume of material has been a little exhausting, but that is, of course, compounded by the weight of the subject. From reviewing the horrors of a year ago–now even more horrific, thanks to many new revelations about the disaster–to contemplating what lies ahead for residents of Japan and, indeed, the world, it is hard just to read about it; living it–then, now, and in the future–is almost impossible for me to fathom. But while living with the aftermath might be hard to imagine, that such a catastrophe could and likely would happen was not. In fact, if there is a theme (beyond the suffering of the Japanese people) that runs through all the Fukushima look-backs, it is the predictability–the mountains of evidence that said Japan’s nuclear plants were vulnerable, and if nothing were done, a disaster (like the one we have today) should be expected. Although many politicians have characterized 3/11 and 9/11 as bizarre, near-impossible events that could not have been foreseen, in both cases there were clear but unheeded warnings. . . . In the case of 3/11, the nuclear plant’s operators ignored scientific studies showing that the risks of a tsunami had been dramatically underestimated. Japan’s “safety culture,” which asserted that accidents were impossible, prevented regulators from taking a hard look at whether emergency safety systems would function properly in a tsunami-caused station blackout. Stover goes on to explain many points where the two nightmare narratives run parallel. She notes how while governments often restrict information, stating that they need to guard against mass panic, it is actually the officials who are revealed to be in disarray. By contrast, in both cases, first responders behaved rationally and professionally, putting themselves at great risk in attempts to save others. In both cases, communication–or, rather, the terrible lack of it–between sectors of government and between officials and responders exacerbated the crisis and put more lives at risk. And with both 9/11 and 3/11, the public’s trust in government was shaken. And that crisis of trust was made worse by officials obscuring the facts and covering their tracks to save their own reputations. By focusing needed attention on threats to our existence, 3/11 and 9/11 have brought about some positive changes. The nuclear disaster in Japan has alerted nuclear regulators and operators around the world to the vulnerabilities of nuclear power plant cooling systems and will inevitably lead to better standards for safety and siting — and perhaps even lend a new urgency to the problem of spent fuel. Likewise, 9/11 resulted in new security measures and intelligence reforms that have thus far prevented another major terrorist attack in the United States and have created additional safeguards for nuclear materials. When it comes to post-9/11 “security” and “intelligence reforms,” Stover is clearly out of her depth, and using the Bush-Cheney “no new attacks” fallacy frankly undermines the credibility of the entire essay. But I reference it here because it sets up a more important point. If only Stover had taken a lesson from her own story. 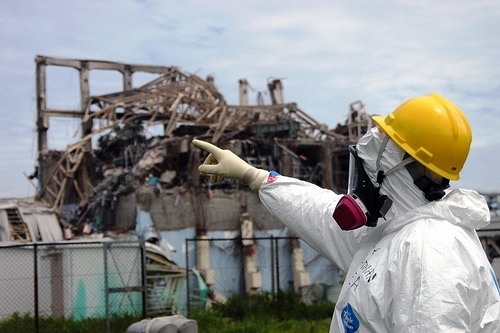 The Fukushima disaster has not alerted nuclear regulators and operators to vulnerabilities–as has been made clear here and in several of the post-Fukushima reports, those vulnerabilities were all well known, and known well in advance of 3/11/11. But even if this were some great and grand revelation, some signal moment, some clarion call, what in the annals of nuclear power makes Stover or any other commentator think that call will be heard? “Inevitably lead to better standards”–inevitably? We’d all exit laughing if we weren’t running for our lives. Look no further than the “coincidental” late-Friday, pre-anniversary news dump from the US Nuclear Regulatory Commission. The Nuclear Regulatory Commission ordered major safety changes for U.S. nuclear power plants Friday. . . . The orders require U.S. nuclear plants to install or improve venting systems to limit core damage in a serious accident and to install sophisticated equipment to monitor water levels in pools of spent nuclear fuel. The plants also must improve protection of safety equipment installed after the 2001 terrorist attacks and make sure it can handle damage to multiple reactors at the same time. Awwwrighty then, that sounds good, right? New rules, more safety, responsive to the Japanese disaster at last–but the timing instantly raised questions. It didn’t take long to discover these were not the rules you were looking for. First off, these are only some of the recommendations put before the commission by their Near-Term Task Force some ten months ago, and while better monitoring of water levels in spent fuel pools and plans to handle multiple disasters are good ideas, it has been noted that the focus on hardening the vents in Mark I and Mark II boiling water reactors actually misdiagnoses what really went wrong in two of the Fukushima Daiichi reactors. Also, it should be noted this represents less than half the recommendations in last summer’s report. It also does not mandate a migration of spent fuel from pools to dry casks, an additional precaution not explicitly in the report, but stressed by NRC chief Gregory Jaczko, as well as many industry watchdogs. But most important–and glaring–of all, the language under which these rules passed could make it that almost none of them are ever enforced. While I am encouraged that the Commission supports moving forward with three of the most straightforward and quickly-issued nuclear safety Orders recommended by their own expert staff, I am disappointed that several Commissioners once again have rejected the regulatory justification that they are necessary for the adequate protection of nuclear reactors in this country. . . . Both the NRC Fukushima Task Force and the NRC staff who reviewed the Task Force report concluded that the new post-Fukushima safety recommendations, including the Orders issued today, were also necessary for the “adequate protection” of existing U.S. nuclear power plants, and that additional cost-benefit analysis should not be required to justify their implementation. While Chairman Jaczko’s vote re-affirmed his support of all the Near-Term Task Force’s recommendations, including the need to mandate them all on the basis that they are necessary for the adequate protection of all U.S. nuclear power plants, Commissioner Svinicki did not do so for any of the Orders, Commissioner Magwood did not do so for two of the three Orders, and Commissioners Apostolakis and Ostendorff rejected that basis for one of the three. As a result, the Order requiring technologies to monitor conditions in spent nuclear fuel pools during emergencies will proceed using a different regulatory basis. More importantly, the inability of the Commission to unanimously accept its own staff’s recommendations on these most straightforward safety measures presents an ominous signal of the manner in which the more complicated next sets of safety measures will be considered. In other words, last Friday’s move was regulatory kabuki. By failing to use the strictest language for fuel pools, plant operators will be allowed to delay compliance for years, if not completely excuse themselves from it, based on the argument that the safety upgrade is too costly. The other two rules are also on shaky ground, as it were. And even if by some miracle, the industry chose not to fight them, and the four uber-pro-nuclear commissioners didn’t throw up additional roadblocks, nothing is required of the nuclear facilities until December 31, 2016. As if any more examples were needed, these RINOs (rules in name only) demonstrate again that in America, as in Japan, the government is too close to the nuclear industry it is supposed to police. And, for the bigger picture, as if any more examples were needed, be it before or after March 11, it really hasn’t been that hard to imagine the unimaginable. When an industry argues it has to forgo a margin of safety because of cost, there’s a good chance it was too dangerous and too expensive to begin with. 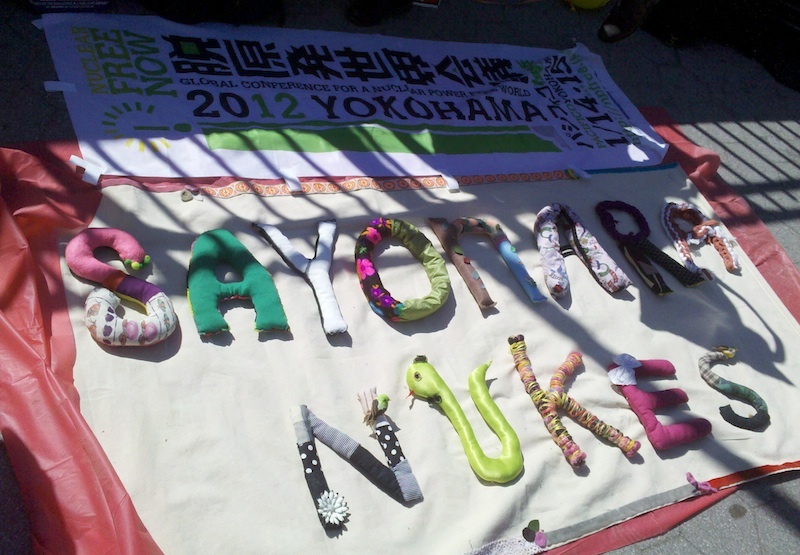 By way of contrast, take a look in at the some of the heartfelt expressions of commemoration and protest from New York’s Fukushima memorial and anti-nuclear rally, held last Sunday in Union Square Park. This is where it all began, December 30, 2005. . . and a few days later, “capitoilette” was birthed as a longer-form sister site. Today, all roads lead (or is it flow from?) here. If you are really into the oldies-but-goodies, you can check out the links on the “about” page. Thanks to all who have kept up (and gotten down) with me through the years. Sunday, September 11, will of course be the tenth anniversary of a tragedy that fundamentally changed America in ways we are still trying to understand. But this 9/11 is also a day for other anniversaries, ones that will likely get little, if any, recognition in the US. In 1985, for instance, September 11 saw a Keystone Kops-like collection of miscues during a test of the remote shutdown protocols at the Limerick Generating Station, a boiling water nuclear reactor outside of Philadelphia. During the shutdown, a valve on a cooling system failed to open, and attempts to manually open the valve were met by a locked door, and a call for a key, which, after a 15-minute wait, turned out to be the wrong key. Once the proper key was found and the door was opened, the operators found the valve’s hand wheel chained and padlocked to prevent accidental opening. Those keys were in the abandoned control room. Bolt cutters had to be used before the operators could finally open the valve. All that time, the reactor core’s temperature was increasing. Fortunately, the test was done during startup, when decay heat is relatively low, so control rods were able to slow the reaction enough to provide time to overcome the multiple barriers to opening the valve. Had the plant been operating at full power when this series of problems occurred, the outcome would likely have not been so rosy. September 11 will also mark six months since the massive earthquake and tsunami that struck northern Japan triggered a series of cataclysmic failures at the Fukushima Daiichi nuclear complex. That accident provides no amusing anecdotes or happy endings, but those horrible events should provide a loud wakeup call and numerous object lessons for nuclear power programs across the globe. As previously noted, the Japanese nightmare and domestic political realities have spurred German Prime Minister Angela Merkel to announce a rather rapid phase out of her country’s nuclear plants. The Japanese government, too, has spoken of turning away from nuclear power and toward renewable alternatives. But here in the United States, six months on from Japan’s quake, there are no such proclamations or pledges–if anything, quite the contrary–and almost no movement on even the most incremental of recommendations. Last month’s record earthquake in the eastern United States may have shaken a Virginia nuclear plant twice as hard as it was designed to withstand, a spokesman for the nuclear safety regulator said on Thursday. Dominion Resources told the regulator that the ground under the plant exceeded its “design basis” — the first time an operating U.S. plant has experienced such a milestone. . . .
“We are currently thinking that at the higher frequencies, the peak acceleration was around 0.26” g, which is a unit of gravity that measures the impact of shaking on buildings, said Scott Burnell, an NRC spokesman. The plant was designed to withstand 0.12 g of horizontal ground force for parts that sit on rock, and 0.18 g for parts that sit on soil, Burnell said. Dominion’s sensors recorded average horizontal ground force of 0.13 g in an east-west direction and 0.175 g in a north-south direction, officials said. The apparent discrepancy seems to stem from the distance between instruments used by the US Geological Survey and those cited by North Anna’s operator, Dominion, but even taking the smaller numbers, the design limits of the plant were exceeded. [A]n analysis of plants hit by earthquakes had shown that the most vulnerable components were ceramic insulators on high-voltage lines that supply the plants with power and electrical relays, which resemble industrial-strength circuit-breakers and switches. Even if the relays are not damaged, they might be shaken so that they change positions, cutting off the flow of electricity or allowing it to flow without any command from an operator. As previously noted (with more than a hint of irony), in order to safely generate electrical power, nuclear plants need an uninterrupted supply of electrical power. Without electricity, cooling systems and important monitors in both the reactors and spent fuel storage pools cannot function. Without effective cooling, nuclear facilities are looking at a series of disasters like the ones encountered at Fukushima Daiichi. That the most quake-vulnerable components directly affect a nuclear plant’s power supply is yet another data point underscoring the urgent need to review and enhance seismic safety at US facilities. But even before that nation-wide examination can take place, the damage to the shaken North Anna plant needs to be surveyed and analyzed so that Dominion might restart its reactors. What does Dominion need to show in order to get the thumbs up, what criteria need to be met, what repairs or retrofits should be required? To paraphrase the head of the NRC: Who knows? In an interview last week, NRC Chairman Gregory Jaczko told Reuters it was unclear what the plant would need to show to resume operations because it is the first time an operating plant has sustained a beyond-design-basis quake. As Hurricane Irene revealed the lack of national guidelines for what to do in the face of an approaching storm, the Virginia earthquake has shown that the United States has no regulatory regime for learning, analyzing, or acting on data from events that exceed the often-negotiated-down design parameters of its nuclear facilities. Yes, the nuclear industry has written its own post-event checklist, and, in the absence of any other standard, is left alone to use it. Beyond the fact that no one is actually suggesting the 1978 plants get traded in for newer models (just augmented with them), cars have to compete for consumer dollars in a way that nuclear plants do not. Nuclear plants could not be built, fueled, operated or maintained without massive subsidies, loan guarantees, and infrastructure commitments from the federal government. Also of note, a 2011 automobile is safer and more efficient than a 1978 model because of government regulation. The auto industry has fought improvements like mandatory airbags, three-point restraints, and CAFE standards, but a strong government imposed those requirements anyway. And your toddler is safer in that car because the Consumer Product Safety Commission reviews the design of child car seats, and laws mandate their use. Where the comparison does work, however, is that both represent a false choice. Just as a car is not the only way to transport a toddler, nuclear plants are not the only means by which to generate power. And in 2011, there are many more choices, and many safer choices, than there were in 1978. Which recalls the important contrast between a country such as Germany–which, faced with a restive electorate and lessons to be learned from Japan’s misfortune, has made a commitment to not just trade in nuclear but trade up to renewable alternatives–and the US, where corporate influence and politics as usual have left the government with seemingly few options beyond willful ignorance and calcification. Even without recognition of the Japan quake’s semi-anniversary, September 11 will probably be a tense day for most Americans, especially those with personal connections to the events of ten years ago. But while remembrance will be hard, it will mostly be so because of an event now relegated to history. Residents of Japan, still living with an ongoing and ever-evolving threat, cannot so neatly define their anguish. And if there is a message to be found in this coincidental concurrence of dates, it perhaps springs from there. While Americans can debate what could have been done to prevent the attacks of 9/11/2001, it is a debate held in hindsight. For the Japanese dealing with the aftermath of their disaster, hindsight still seems like a luxury to be enjoyed very far in the future. But, for the United States, a debate about what can be done to prevent a Fukushima-like disaster here is theoretically blessed, both because it is a debate that can be had before the next crisis, and because it is a debate that can be informed by events. And experience, science, economics and common sense are all pretty clear on what needs to be done.